The fastest bird in the world has made the 212ft steeple of a church in Perth its safe haven. 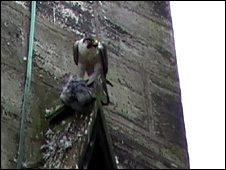 Peregrine falcons can often be seen feeding and perching on the structure of St Matthew's in Tay Street. An "Aren't birds brilliant!" project has now been set up by the RSPB Scotland to allow people to view the birds and find out more about them. It is expected that during the next few weeks, visitors will be able to see chicks learning to hunt. At one stage peregrine numbers in the UK were very low. During the 19th and 20th centuries, the population plummeted because of illegal killing by humans. Then in the late 1950s agricultural chemicals got into the food chain and caused the birds problems. However, numbers have since picked up and they are moving into urban areas. Daniel Brown from the RSBP said: "The peregrine falcon's the fastest bird in the world, reaching speeds of 120mph to 200mph. "It's also a very cosmopolitan species. It is found throughout the world, from the sub Arctic, down into the jungle and increasingly it is found in towns and cities." Visitors to the project at St Matthew's Church will be able to use telescopes and binoculars to view the peregrines when they decide to pop by, but also watch recorded footage and find out information. Mr Brown said: "There've been peregrines that have been spotted on the church for the past few years now and there's been quite a lot of activity. "We thought that the peregrines might be nesting in the church. However, it's turned out not to be the case and they're actually nesting on the outskirts of Perth and they come into the town centre to feed on the feral pigeon population. "So they use the church itself as a perching spot to look out for prey and also to handle the prey once they've caught it." Rev Scott Burton of St Matthew's said: "This is a fascinating project and we, particularly as an eco-congregation, are very proud to be part of it. "The peregrine is one of God's amazing creations and to see it so close at hand is a wonder to behold." The "Aren't Birds Brilliant!" project will be open Fridays, Saturdays and Sundays until 3 August.